The 2019 Jaguar Simola Hillclimb, which takes place from 2 to 5 May, is shaping up to be the most thrilling edition yet, and the big guns of the tin-top racing fraternity are preparing for an epic battle for King of the Hill glory. The Modified Saloon Car category, or Class B, represents the ultimate in road-derived race cars, with a total of 41 mild to absolutely wild machines set to be unleashed on the 1.9 km Simola Hill course – making it the biggest and most competitive category this year. The man with a target on his back is undoubtedly Wilhelm Baard, the reigning three-time King of the Hill champion. The former Group N production car racing driver won the 2017 and 2018 editions in a fire-breathing, radically winged iteration of the venerable Nissan GT-R, funded and run by BB Motorsport. The car has been tweaked even further for the 2019 Jaguar Simola Hillclimb with the help of the Japanese brand’s performance division, NISMO. "The car was far from perfect last year, but from our past success at the Hillclimb and the global reach this event has created, we have been fortunate to get assistance from NISMO, and have implemented several changes and upgrades for this year," Baard says. "We fitted a completely different aerodynamic package and achieved significant weight savings, while also revising the suspension set-up on the GT-R," he adds. "Although we had plenty of power last year, the team has worked on more effectively transferring that power to the road, so we will have a much better package overall.”Despite having obliterated the Class B record last year with a new benchmark time of 39.463 seconds (achieving an average speed of over 173 km/h from a standing start), Baard is confident of setting new records in 2019.“I have no doubt that the current time will be reduced this year,” he states. “Last year I clipped a tyre next to the track, which ripped off the front splitter and pulled the turbocharger boost pipes off on the steepest part of the course, 200 metres from the end. Given the same conditions, a time of 38 seconds is feasible, and probably a must this year if you want to win.”There will be truckloads of interest and intrigue as Baard faces off against his rivals – both in Class B5 for four-wheel drive unlimited cars (five cylinders and above) and for the overall Modified Saloon Car crown. One of his most formidable adversaries this year is none other than multiple Classic Conqueror and King of the Hill winner, Franco Scribante. The Italian ace will also be heading to the start line in a Nissan GT-R this time around, after struggling for traction last year in his rear-wheel drive Porsche GT3R against the four-wheel drive competitors.“This is going to be a very hot GT-R with a lot of special tricks,” Scribante enthuses. “We have an aerodynamic package developed by the same team that helped win the World Time Attack series with a Porsche, so it will have serious downforce and serious power!”There are a further seven highly modified Nissan GT-R entries in B5, but Scribante predicts that the fiercest challenge is likely to come from the Joubert brothers: Charl with his turbocharged Honda 3.5 V6-powered Lotus Elise in Class B4 (2WD Unlimited, five cylinders and above), and Dawie with a Lotus Exige fitted with a 2.4-litre turbocharged Honda engine in B2 (2WD Unlimited, four cylinders).Charl finished second in 2018, losing out to Wilhelm Baard by a mere 0.056 seconds, while Dawie landed up third, just over half a second off the lead. “I know Dawie and Charl have been doing a lot of work on these cars, and have rebuilt them specifically for the Hillclimb, so they are going to be very fast,” Scribante says.Also of particular interest in B2 will be the 1989 WesBank Modified Toyota Conquest, driven by Nico Roets. In Class B3 for four-cylinder 4WD cars, Anton Cronje will be back with his rapid Subaru Impreza WRX STi, going head-to-head with the likes of Shane Naidoo (Mitsubishi Lancer Evo 9) who will be completing his 10th Simola Hillclimb this year. Some of the other fierce challengers in B4 include Stuart Kidgell in his GTR Ultima, Pieter Zeelie (Toyota MR2 Super GT) and Wade van Zummeren in a fire-breathing Nissan Skyline.The rumbling V8 Masters entries are grouped in Class B7 for eight-cylinder engines and above. The ever-popular Enzo Kuun will be competing against the trio of US drivers from the Inde Motorsports Ranch in Arizona. Kai Goddard, Inde’s VP of Business Development and lead professional driver, is joined by Steve Kimpton for their third Jaguar Simola Hillclimb. The third member of the visiting team is Dave Smith, who has more than 20 years of experience racing in a wide variety of cars and formulas, along with working as a championship-winning mechanic in IndyCar and Indy Lights. He also does professional driving instruction and race coaching, and is a stunt and precision driver.Franco di Matteo will be entering the fray in B7 with his Jaguar V8 Supercar, along with Marcel Angel (Ferrari 458 GT3), Hennie Bosman (Chevrolet Corvette ZR1) and Ricky Giannoccaro in a screaming Lamborghini Gallardo Super Trofeo.Adding a different spin to the race-bred mix is Class B9 for unlimited bakkies and SUVs. Cross country racer Terence Marsh will be competing in a V8-powered FIA-class Nissan Navara that competed in the 2019 Dakar Rally. Peter Lindenberg returns in the latest evolution of his supercharged Savage Ford Ranger 660, while Ryno Scheepers will be joining the starting line-up in an unusual 1976 Mazda F1000 powered by a turbocharged 1.3-litre rotary engine. There truly is something for everyone at this year’s 10th edition of the Jaguar Simola Hillclimb, so don’t miss out!Be sure to secure your tickets as the limited number of Pit Access, Turn 2 Grandstand Seating, as well as Pit Priority Parking tickets are over 50% sold out! Online ticket sales are available here. 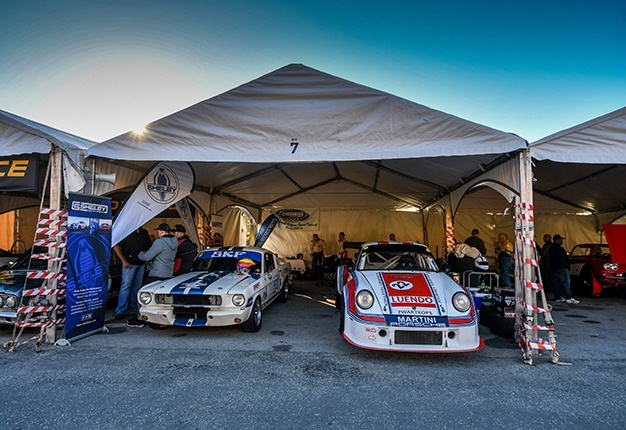 The exclusive VIP Hospitality packages, which include event and pit entry, as well as access to the Le Mans VIP Lounge or Piston Club are over 60% sold out – so book your tickets now to secure the best motoring and motorsport experience South Africa has to offer! Four-time Classic Car Friday champion, Franco Scribante, returns to the Hill to defend his title in the rapid 1970 Chevron B19. Castrol has joined the Jaguar Simola Hillclimb as the official lubricants partner, as well as the media service partner from 2019.